Teaching classic barbering techniques for decades. Tim Hite is the founder and owner of The Barber School (16 W. 7200 South, Midvale, 801-304-7000), which opened six years ago to train students in classic barbering methods. Hite, a master of every major cutting method, cuts hair daily, and says that during his decades in the industry, he’s taught more students the art and craft of barbering than any other living teacher. Is The Barber School unique in America? It’s the only one I know of that does classic barbering, which blends the styles and methods of yesterday with today. I was just working with a student—she’s been here for a few months—and she said it was much more difficult than people think. She was specifically talking about a classic taper cut, which takes a lot of training. We teach proper barbing. A person can know nothing about anything and enroll, and when they finish, they are a good barber. They can set up their tools in a good shop and go to work and cut anyone’s hair. Barbers have to be aware of a person’s time, how to greet them, how to talk with them. There are people of all ages that want barbering. There are 14 different classic cuts, like a taper, flat-top, or pompadour. You have to suit the haircut to the person. Shaving is part of it, too. If you can’t do a good shave and a good haircut, if you take too long or you cut it too short, it’s probably not a good haircut. I wanted to be a barber all my life, from the time I was a baby. I didn’t want to be anything else. It’s an artistic thing. We have to know art principles to be a proper barber. Each person is different; each person has looks that are good for them. We have to recognize all of that—what shape their head is, what clothes they wear. We put the right cut on the right person. We want them to feel happy and satisfied when they get out of the chair. I don’t like to give someone a fresh haircut that looks like they just got a haircut. I like to give them something natural. That’s why I became a barber, really. Why don’t real barbers use guards? Someone who uses guards doesn’t take the scalp into consideration. You have to know when to start and when to stop the taper. Guards don’t take that into consideration. It’s just a No. 1 on the sides and a No. 2 on the top. Cosmetologists have been taught to use guards, but that’s just quick and easy and not a proper haircut. How many students have you taught over the years? I don’t keep numbers. 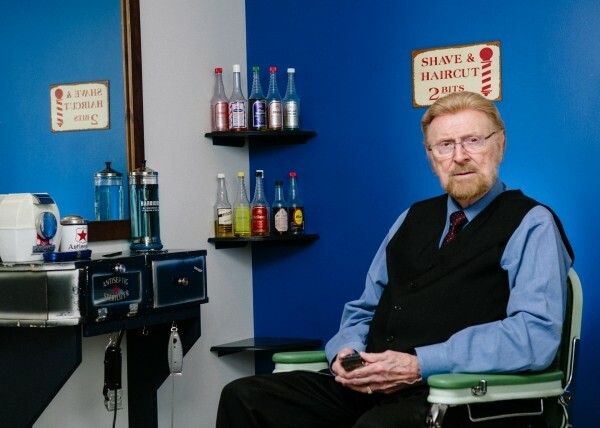 I started teaching in the ’50s, and I’ve taught countless people that are still barbering and some that are now retired. I’ve probably taught more people than anyone still teaching. Actually, I’m sure I have. A lot of people don’t know the things I know, so I’m still trying to pass it along to new people who want to learn. I think it was once a dying profession, yet it’s important, and it’s always been with us. So I keep teaching. Has much changed in barbering since you started, decades ago? In the last few years, people think they are a good barber if they can do a high & tight cut—that’s a new thing. These specialty things have also come in, like a rat or Hitler or with the writing on the scalp. But they can do that without barber school. You have to learn a lot of the ideas that take time to learn to be a proper barber.